Well here we go, 3 days to go until the 2016 ParaCycling Track World Championships and 177 days until the Rio Paralympics, 2016 is all of a sudden getting interesting. These World Championships are the last stepping stone of a 4 year quest I’ve set myself on since the disappointment of the 1km TT in London in 2012. Things up until last year had been going really well, I’d managed to retain my titles in the 1km TT in Aguascalientes 2014 and Apeldoorn 2015, in doing so reduce the WR time to 61.466 in the thin air of the Mexican velodrome, and also bring my sea level best time down to 64.381. But during the summer of 2015 when getting back into the gym I managed to cause a minor injury to my elbow, little did I know it was going to be still causing me issues 9months on. The injury itself wasn’t anything to right home about, golfer elbow, but it affected so many things I was doing that my training became seriously compromised, out of saddle accelerations, standing starts all had to bite the dust, as well as a number of useful exercises in the gym. Thankfully the injury didn’t stop my ability to ride the bike, although I was limited to doing all efforts in the saddle. Over the weeks and months, we put together a training program that worked on areas that I didn’t normally focus on, and these would hopefully would keep me on track with my 2016 goals. At the end of September, I had to withdraw from the 1km TT at the national championships as I was still unable to start the bike without pain. 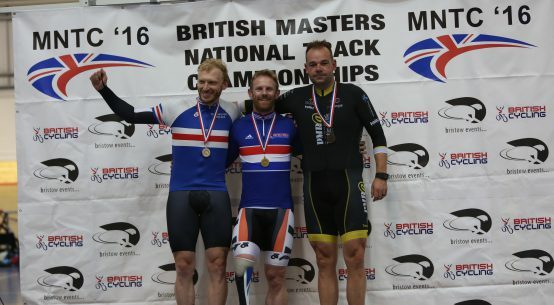 However I could ride the Open Sprint competition and ParaCycling 200m. Both of these events comprised of the flying 200m TT, which I could ride as long as I didn’t get out of the saddle. This ended up being a perfect test of the training I’d been doing. In the morning I set a new PB/WR by 0.077seconds to take it down to 10.684, in the afternoon learning from the mornings 200 I took a further 0.153 seconds off for another PB/WR of 10.531. It was clear that the work I’d been doing was working and things were still on track. Come November I was still having issues with my elbow, although I was still making progress with what I could do. With the C1 event in Manchester I again had to withdraw from the 1km TT, something I didn’t really want to do, but I needed to keep the bigger picture in mind. It was difficult as this event was one of those very few opportunities where I can actually wear the rainbow stripes I’d earned in Apeldoorn. Although unable to ride the kilo I was able to ride in the team sprint, the nature of the ParaCycling event meant that I was still able to start by using a seated start and get onto the 2 riders in front of me. This was a groundbreaking moment, not so much for my injury, but in the fact that it was the first time since 2011 we’d manage to run a team that not only was fast, but we’d be competitive on the world stage. Teaming up with Jon-Allan Butterworth who was returning to the squad after a year away, and our new star from Athletics Kadeena Cox, with no practice we gelled together on that first ride to set a time quick enough to make the final in Apeldoorn, and then in our final ride we found even more time to dip under 50seconds and set the fastest time in the world in 2015. With a training camp in Majorca and Valencia under my belt things have been going from strength to strength and I feel in a good place ahead of these world championships. I finally managed to get out of the saddle and do some standing starts just a few weeks ago, as my elbow is nearly back to full strength. It’s going to be a tough championship in the sense I’ve not ridden the kilo in 12months, but I’m in good form and looking forward to putting all the pieces together on Thursday. 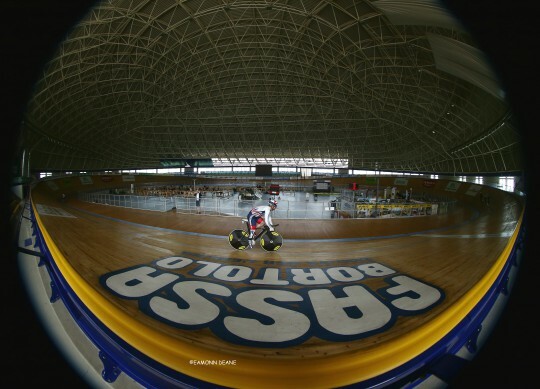 This track has happy memories for me as I rode to the gold in the team sprint and kilo here in 2011, both in WR times. Hopefully if it all goes well I can pick up where I left off 5years ago. If you want to follow the event, British Cycling will be live blogging from the track center via their website www.britishcycling.org and if you’re on twitter you can follow the #paracycling2016 hashtag for all the latest information. Catch you all on the other side as the countdown to Rio continues.